Parents who want to give their kids a lighter, higher-quality 16-inch bike without spending a mint will still be hard pressed to do better than the ByK E-350. The Schwinn SmartStart series, including the Schwinn Grit and Petunia, is our updated pick for the best cheap 16-inch kids bike. It won't weigh kids down as much as other budget bikes. Although the ByK E-350 costs more than a big-box store bike, its exceptional engineering shows in its superior ride. The low, lightweight frame and larger wheels help little riders build the confidence for fast riding on flat pavement. Other perks include a bell and training wheels for kids not quite ready to ride on their own. A quick-release seat post makes it easy to adjust the bike for a growing child. Specs that Matter Frame: Aluminum Weight: 20 lbs Max. seat height: 29 in. Bigger kids who are ready to ride with more speed and confidence will appreciate the ByK E-450. 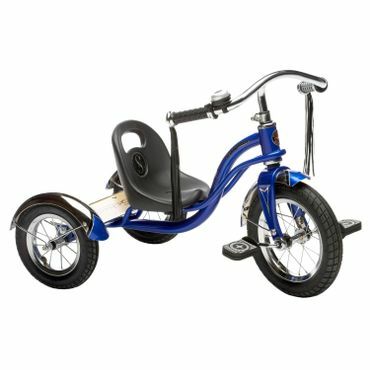 This ByK features a lightweight (less than 20 pounds) aluminum frame that makes it easier to pedal and a low-center-of-gravity design that's more manageable for kids, resulting in a faster, higher-quality ride. Hand brakes and an easy-to-adjust seat add to the ByK's value and ease-of-use. Extras include a bell and kickstand. The Schwinn Roadster has a classic look and timeless appeal that draws many admirers, but its durable construction is what earns raves. The steel frame and rugged air-filled tires are built to last and allow for better traction outdoors. Other features parents will appreciate include an adjustable seat, easy assembly, and a low center of gravity that helps the trike resist tipping. Kids will like the shiny bell and streamers. Specs that Matter Frame: Steel Weight: 6.5 lbs Max. seat height: 19 in. 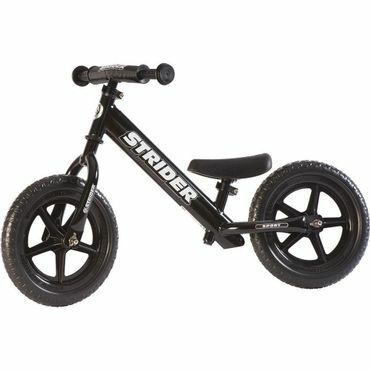 Reviewers say the Strider 12 Sport is a great investment for parents who want a balance bike that will grow with their children from toddlerhood into the preschool years and beyond. Two included seats (small and large) and a wide range of adjustability keep the bike comfortable for younger and older kids, and a lightweight frame means even the smallest kids can maintain control. The no-flat foam tires and easy-to-adjust seat also win raves. Specs that Matter Frame: Wood Weight: 8 lbs Max. seat height: 16 in. 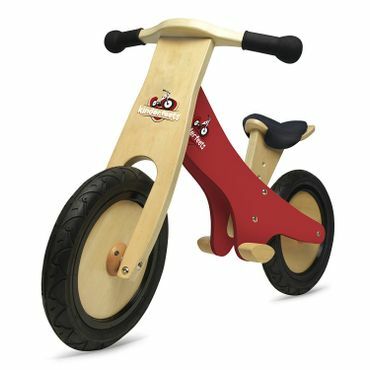 Wooden balance bikes have more of a toy-like, heirloom appeal than their metal counterparts, and reviewers say the Kinderfeets Balance Bike delivers on those points. The eco-friendly birch frame, Dutch design and range of color choices please most parents, and kids like the chalkboard-painted finish that lets them draw on their bikes. Removable wooden footrests, a washable seat pad and no-flat rubber tires are among the other features reviewers appreciate. Specs that Matter Frame: Aluminum Weight: 17 lbs Max. seat height: 21.3 in. Lightweight but not too pricey, the RoyalBaby Space No. 1 is a solid choice for parents who want their tots to start on a pedal bike. The aluminum frame won't weigh down tiny riders as much as steel-frame bikes, and it includes a nice range of extras: training wheels, a bell, a water bottle, and even a hand brake on top of the regular coaster brake. They also say assembly shouldn't require expert assistance. Kids' pedal bikes are typically categorized by wheel size, and two of the most common are 16- and 20-inch models. It's best to have your child try a bike before you buy it to check for proper fit, but, in general, 16-inch bikes are best for 3- to 6-year-olds; 20-inch models are typically a better bet for 6- to 10-year-olds. Most 16-inch kids' bikes still come with training wheels and easy-to-use pedal-controlled coaster brakes; they may also have extras such as bells, horns, streamers or baskets. Once your child is old enough for a 20-inch bike, you'll have more "serious" features to choose from, including hand brakes, suspension systems and multiple gears. Training wheels are less common on this size bike, however. Parents with very young children often start their children on a tricycle. On tricycles, children can learn to steer and pedal without fear. Trikes are generally low to the ground, and the third wheel adds stability compared with two-wheeled bikes. While classic trikes with metal frames and shiny chrome accents are still out there, others are made of heavy-duty plastic. Unsurprisingly, the former is usually more durable, but also more expensive. Traditional tricycles can help teach your child confidence, pedaling and control, but they will not help develop balance. That's where balance bikes come in. These lightweight bikes look much like a regular pedal bike, except there are no pedals. Children scoot along using their feet to start and stop, learning how to balance during the brief time that both feet are off the ground. Most balance bikes have metal frames, but others are made of wood. Metal balance bikes are a bit more durable for outside play, while wooden models have equal appeal as an indoor toy. If a trike or a balance bike doesn't seem quite right, there's a third option. Twelve-inch bikes with training wheels are also available for smaller riders (roughly ages 2 to 4). Steel-framed 12-inch bikes, often plastered with cartoon characters, are a common sight at big-box stores. But parents should note that those cheap models are often extremely heavy, making it hard for children to pedal and steer independently. Higher-quality 12-inch bikes with lighter aluminum frames are available through specialty bike shops or online, but they're usually much pricier -- up to $300 compared to $70 or $80 for a typical big-box store bike. "Pedal Bikes: Comparison Charts and Ratings"
"The Best First Pedal Bike"
Expert reviews of kids' bikes are relatively scarce. An exception is Two Wheeling Tots, a site run by avid cyclists with several comparative reviews of balance bikes and pedal bikes, as well as the similar Rascal Rides. Comprehensive product review site Wirecutter has recently published a guide to kids' first pedal bikes, and some bike publications such as Bicycling also include occasional recommendations and reviews of kids' bikes. Sites from the International Bicycle Fund and IceBike include helpful buying and sizing guides, but don't recommend specific bikes. Most helpful are parents' reviews at sites including Amazon, Target and Walmart. We considered reviewers' perspectives on bike performance and durability while evaluating our sources to help you find the best kids' bikes. Buyers who can afford to spend a bit more on a lightweight bike that can help foster a love of riding should seriously consider the ByK E-350 (Est. $215), reviewers say. Though it technically has 18-inch wheels, the long, low frame is sized like that of a 16-inch bike. It's recommended for 4- to 6-year-olds who are roughly 38 to 46 inches tall, and it comes with removable training wheels and a bell. Seat height ranges from 18 inches to just over 23 inches. Available colors include white with blue, red, purple or pink accents. At a bit over 17 pounds, the ByK E-350 is much lighter than most bikes that are readily available in big-box stores thanks to its aluminum alloy frame. Experts with Two Wheeling Tots say the ByK also has narrower tires and higher gearing than other similarly sized bikes, making it ideal for faster riding on flat pavement. It has both a rear coaster brake and hand brakes, but experts warn that the hand brakes may be tricky to operate for small hands. There is a quick-release seat post for easy seat adjustments, and while parents report few issues with assembly, some say the directions are lacking. Reviewers are happy with the quality of their ByK, but there are few reviews that speak to long-term durability. ByK warranties most components for one year, but extends that to 10 years for the bike frame and fork. Parents looking for a 16-inch bike that strikes a good balance between price and quality will want to investigate the Diamondback Mini Viper (Est. $150). 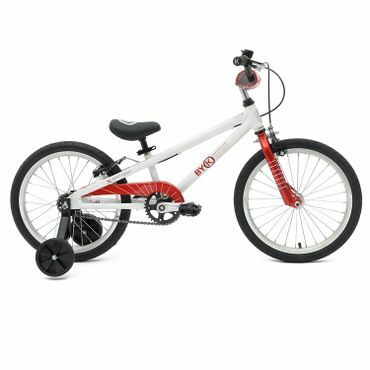 Recommended for kids ages 3 to 6 and riders 38 to 45 inches tall, this BMX bike comes with removable training wheels. Seat height is adjustable and ranges from 20 to 24 inches. The bike comes only in blue. At a bit over 21 pounds, the Mini Viper is fairly heavy -- a common issue with kids' bikes. Despite its heft, reviewers say it's easy for their kids to maneuver and even carry as they get a bit bigger. Experts with Two Wheeling Tots say the Mini Viper has a relatively upright handlebar height that may prove tricky for newer riders, but it doesn't draw complaints from parent reviewers. The bike has an easy-to-use rear coaster brake. It lacks the quick-release seat post that some comparable bikes boast; adjusting seat height requires an Allen wrench. The bike comes mostly assembled, and reviewers say it's easy to finish the job in about 15 minutes. The Mini Viper really shines when it comes to quality and durability, especially compared with other bikes at a similar price point. Parents say the steel frame feels sturdy, though a few complain the plastic training wheels are flimsy. A handful of reviewers also say their bikes came with a flat tire. The bike frame comes with a lifetime warranty; other parts have a one-year warranty. Parents who want a slightly lower-cost 16-inch bike that still isn't as heavy as a lot of the competition will want to look at the boys' Schwinn Scorch (Est. 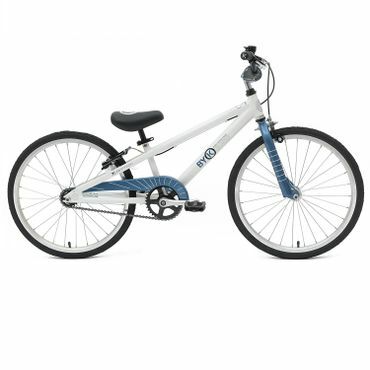 $125) or girls' Schwinn Jasmine (Est. $130). Both bikes are part of Schwinn's SmartStart series and are recommended for kids 38 to 48 inches tall, or roughly ages 4 to 6. The seat height is adjustable from 20½ to 24½ inches, and there are different colors of SmartStart bikes available at different retailers. At about 20½ pounds, the Schwinn Scorch and other 16-inch SmartStart bikes are heavier than some pricier options, but for the money, they're still among the lighter bikes you can buy, especially at major retailers, experts with Two Wheeling Tots say. They also say the overall geometry is better on these bikes, with pedals that are closer together and a longer wheelbase that provides more room for kids' knees to move during pedaling. The bike is equipped with both a coaster brake and a hand brake, rare for a young kid's model; however, experts say the hand brake can be tricky to use and adjust. The seat has a quick-release post that allows parents to quickly adjust seat height without tools. The bike does require assembly, but most parents say the process is easy. Schwinn's 16-inch SmartStart bikes come with training wheels but no kickstand. Additional accessories include things like front plates or baskets, but they vary by model. Reviewers do report a few quality-control issues here, including bikes that arrive with bent wheels and pedals that come loose too often. The bike comes with a limited lifetime warranty on the frame; other parts are warranted as long as the original owner owns the bike. The exception is normal-wear parts such as tires or tubes, which are covered for 30 days. If you're looking for a 20-inch bike for a slightly older, taller child, reviewers say the ByK E-450 (Est. $225) will provide a quality ride at a mid-range price – higher than big-box options, but still much lower than many comparable-quality models, experts say. 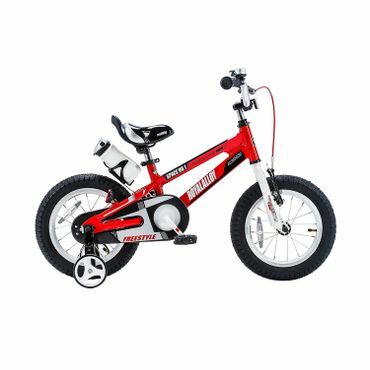 ByK recommends this single-speed bike for kids 5 to 8 years old and 43 to 52 inches tall; seat height is adjustable from about 23 to 29 inches. It's most widely available in white with blue or green accents. A kickstand and bell are included, but there are no training wheels. The ByK's biggest advantage over cheaper 20-inch bikes is weight -- its aluminum alloy frame weighs under 20 pounds. Experts with Two Wheeling Tots say that can make a big difference, and combined with a low center of gravity, kids can ride "easier, sooner and faster" on the ByK. Reviewers echo this praise, saying those features help minimize frustration and build confidence. Experts do note, however, that the ByK has narrower tires than many other choices, which might mean a few more wobbles for hesitant riders. The ByK comes with both a coaster brake and dual hand brakes. A quick-release seat post makes adjusting seat height easy. ByK warranties most components for one year, but extends that to 10 years for the bike frame and fork. Reviews that comment on durability are minimal. Though it doesn't come with training wheels, the smaller ByK E-350, which we discuss above, has them. Parents can also add them independently. An adjustable seat and handlebars. A frame that's not too heavy.